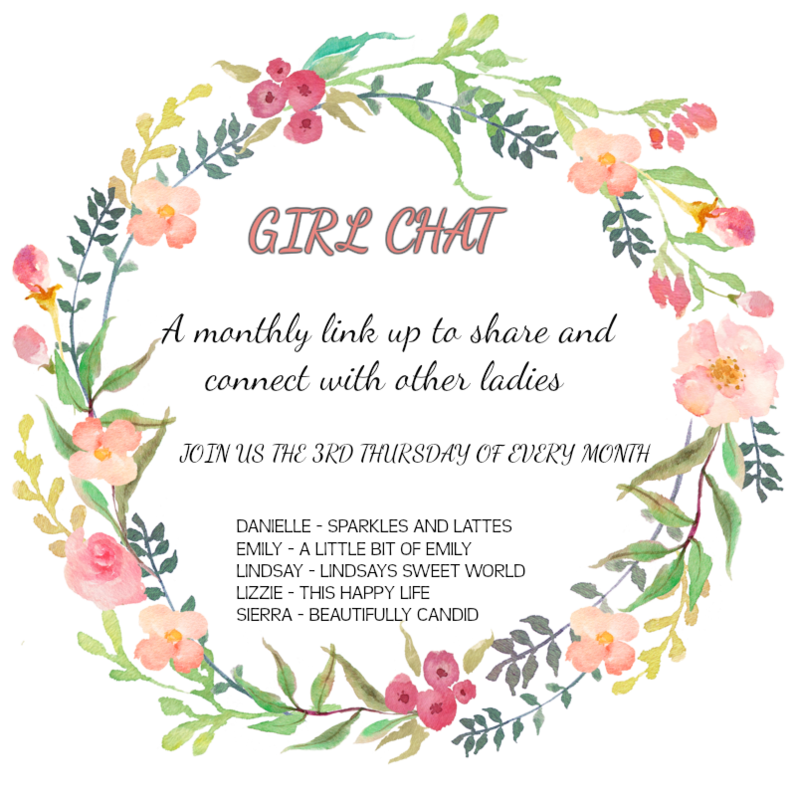 It's time for another round of Girl Chat and this month we are talking about our favorite Christmas ornaments. If I put every single one of my favorites up, this post would be crazy long. So I thought I would just pick out some of my more recent favorites (and a few oldies). First up (in NO particular order)....my wedding invitation ornament. I saw this on Pinterest a long time ago and I knew I had to make it. 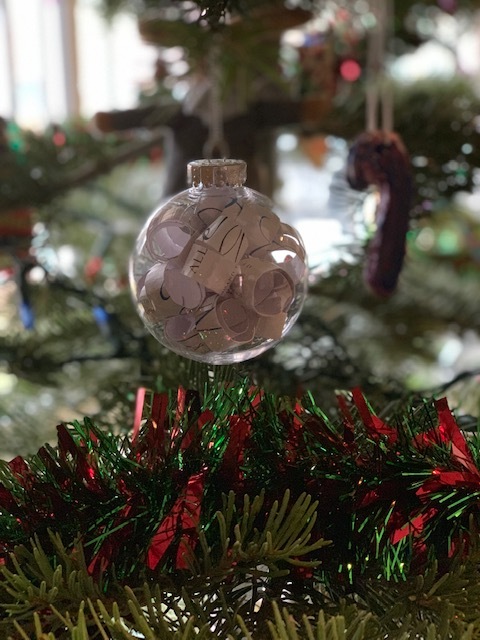 I cut my wedding invitation into strips, curled the strips around a pencil and stuffed them into a clear ornament. Next up....a gold light up ornament that my mom gave me. It was my ornament from her tree and I am not sure who bought it for me, but it has always been a favorite of mine. Next up...two ornaments that I made for my girls using their hospital hats and bracelets. I am sure you have seen these on many people's trees and mine is no different. But I did get the idea to put their names on them (after seeing Emily's tree) and I plan on doing that before I put them away. Next....the girls first Christmas ornaments. I ordered them from Pottery Barn Kids. They are red wooden blocks that have their initial, name, stats, birth date and the day they were born. I didn't take a picture of each of them as they are very close to the same. 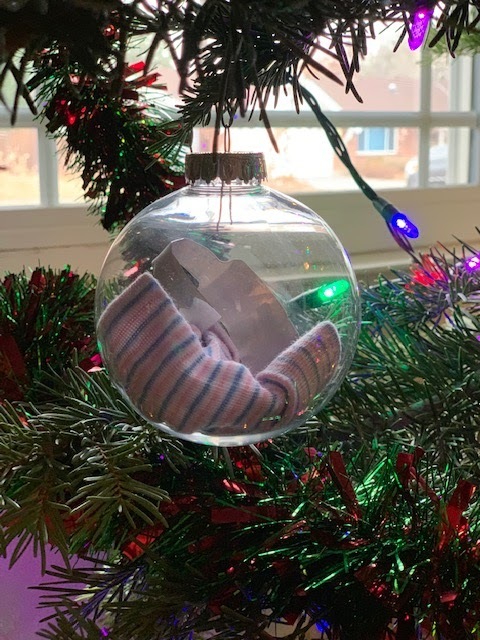 These are the cutest first Christmas ornaments. Next....is my first Christmas ornament. 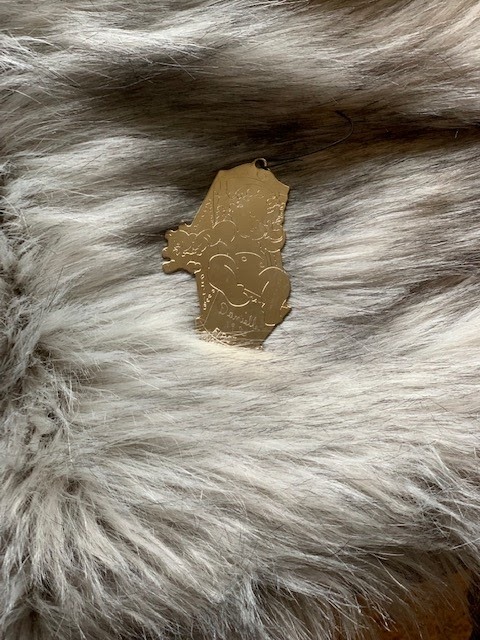 It is a gold flat ornament with my name and year of birth. Next...my parents got Rory and I a Hallmark First Year of Marriage ornament. It's white, sparkly, has our wedding year and two red love birds hanging in the center. 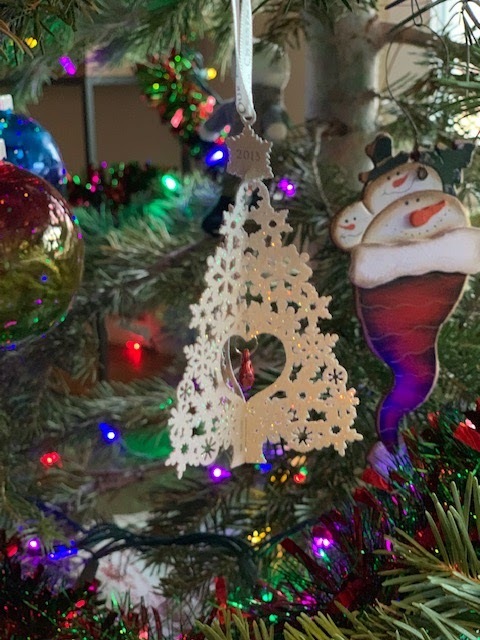 Next....when I went to Scotland in 2016, I started to buy Christmas ornaments on all of my work travels. I found the cutest Christmas shop in Edinburgh (in September) and I bought the ornament below. I have been buying ornaments from all of my travels since then and I get to add a few new countries this year! Finally, my mom gave me this little guy when I moved out. He is simple, but so cute and reminds me of my childhood. I love buying ornaments on our travels! It brings a little bit of everywhere we've been into our home. Like you, most of my favorite ornaments are ones that are sentimental too. That is exactly how I feel about my travels and finding an ornament. 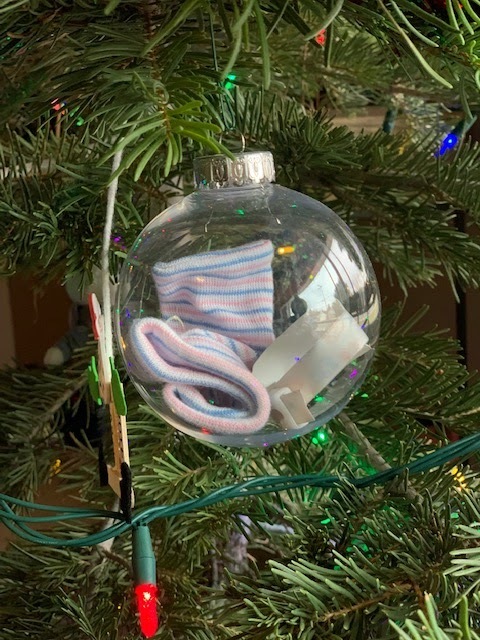 OMgosh, I LOVE the idea of putting your baby's hat and hospital bracelet in an ornament! I have never seen that idea!!! I love it. If you still have some of yours, they are easy to make and sooo cute! I love these! 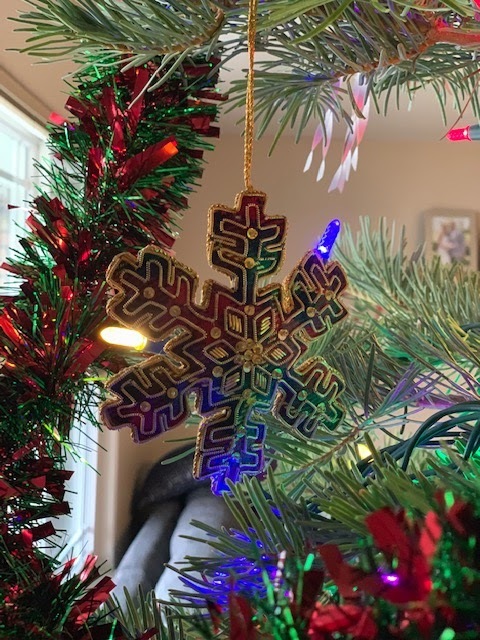 I have somewhat started to try and pick up ornaments on any of my travels but sadly since I started that I haven't had many travels haha Very pretty ornaments! Merry Christmas! Haha. Isn't that the way it always goes. Merry Christmas Brittany! Fun! I love ornaments and hearing hte stories behind them :)! Me too! 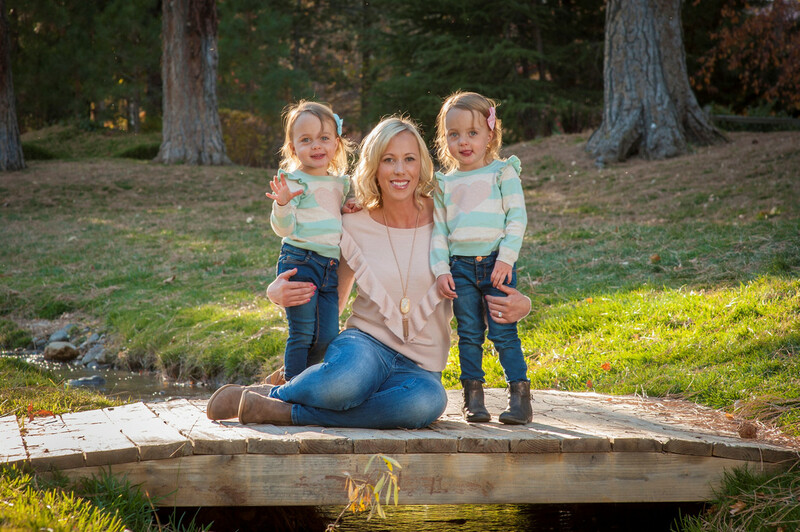 It is one of my favorite Girl Chat topics that we have done! Love the handmade ones in the clear bulbs. I keep meaning to do this without invite, but forget every year. I always forget, but now I want to add the girls names to their hospital ones. I love all of your sentimental ornaments in the clear bulbs. 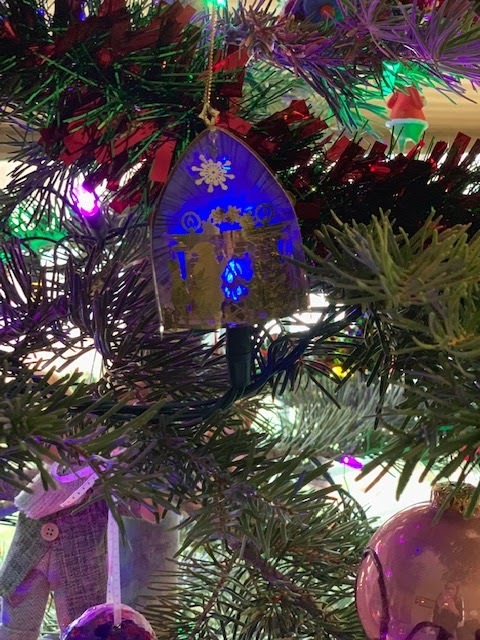 How neat to have those memories and then put them on your tree. 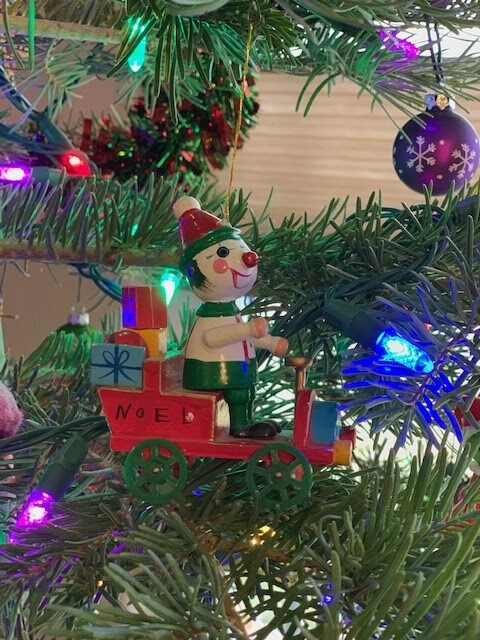 I love all the stories behind your ornaments as well. Thank you. I love them so much as well! I love them all, especially the girls' potter barn ones! I may have to go back and get one for each of my kids first year! You should. They were on sale and free personalization recently. I looked for my new niece or nephew who will soon be here. I remember your wedding invitation ornament! I love that so much! And the ones with the girls' little caps... oh my word! So sweet! 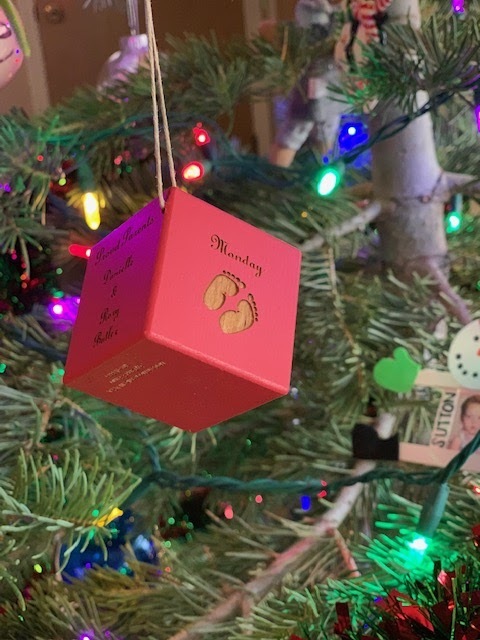 My husband has the same baby's first ornament as you! (The flat gold one) Love it! It is the cutest. It seems like a lot of people our age have that one! I hadnt seen it with the wedding invitation before. That's so cute. My friend just got one of those wedding invitation ones and I love the reuse aspect! I had not seen that before! I love all of your memories! If I had ornaments I'd definitely want to collect where I travel! It is a fun way to remember where you have been! I love these so much!!! We have ornaments from so many places we have been and they are so special. So many cute ones! I think I told you this before, but my mom makes those wedding ornaments whenever she has a wedding to go to. I think it's such a sweet keepsake!